Aardhommel (Bombus terrestris), de paring. Mating large earth bumblebees Bombus terrestris. 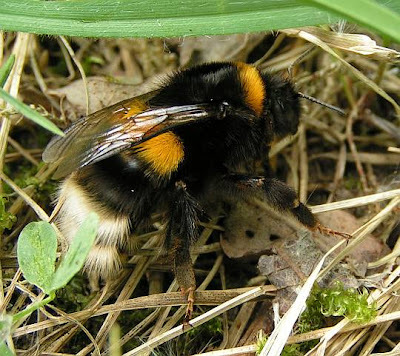 As they largely share the same charactistics we will focus on the largest – Bombus terrestris. Bumble bees are normally docile creatures and do not pose any major risks to us humans – they can sting but are unlikey to do this unless provoked. Fertilised Queens emerge in February and seek out a feed and a nesting site. Nests are usually found in the ground, often old mouse holes. They feed upon nectar and pollen providing flowering plants with a valuable service – pollination. Laying eggs in wax cells in her nest the Queen builds up a colony from 50 to 150 workers. Like all bee’s and wasps the eggs hatch into larvae which then pupate and again hatch, this time into adult bee’s. Towards the end of summer fertile females and males will be produced. Only fertilised Queens will survive through the winter with all the workers, males and original Queen dying. The young fertilised Queens find a safe place to hibernate ready to emerge next spring.